Anyhow after a massive lunch, the crew decided to hit the slot machines. 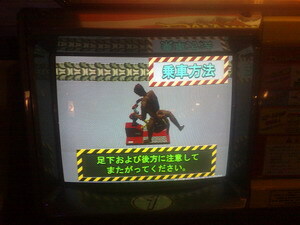 Now, I’m not really a gambler, so I chose to go to the entertainment section instead and play some arcade games. 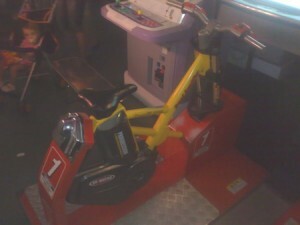 I hit the racing cars, motorbikes and obviously the mandatory Time Crisis 3 game, before I saw the machine that captured my heart – a MTB cycling game! It was called Downhill Bikers. The entire cabinet was empty and wasn’t surrounded by those annoying kids who never have tokens but pretend they’re actually playing the games. Wow, I thought I was in heaven. However, please take note of how the cabinet should look below. And this is how it looked there. Yes, it only had one pedal. 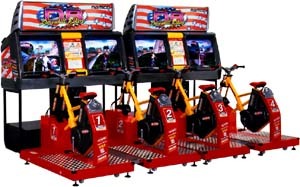 Sigh, explain to me, how are you supposed to play a cycling game where you can’t actually cycle? Look, it's a retard bike! Sadly, the maintenance of the other machines isn’t any better and that is why children devote all their cash to Playstation and X-Box instead of arcades. R.I.P. arcade machines – innovative, fun and always stealing tokens. I don't understand what it says, but it sure looks fun! P.S. I want my tokens back!!! !